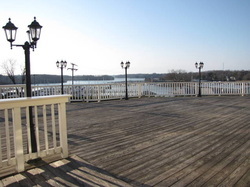 The ceremony will take place on the deck, over looking the yacht basin. Keep in mind that this picture was taken in February, before anything was in bloom. It will look much prettier in April. We plan to incorporate alot of sailing/water imagery into our ceremony. Instead of a unity candle, we will be tying a fishermans knot together, which is the strongest type of knot. I am still figuring out most of the decor for the ceremony, but I definately want to design a monogram for my aisle runner. I will update more and post pictures as I complete my DIYs. Aisle runner - I am going to paint a monogram on our aisle runner. Programs - I am very excited about the idea of cootie catcher programs. I'm afraid it might be a little easier said than done however. Alter/Arch - I have NO IDEA what to do for our backdrop! !